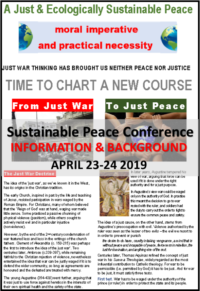 The Just & Ecologically Sustainable Peace Project Conference will be held in Melbourne on 23-24 April 2019. “By now you will have heard and/or seen information about the Earth at Peace initiative. This purpose of my sending you this letter (and the attachments!) is to update and further inform you of what is happening, and to ask for your support. If you have missed out on the brochure and/or flyer on the conference please let me know and I’ll forward them to you. There is an emerging worldwide effort in international law, ethics and religious scholarship to respond to our deeply fractured, often violent world. The just war doctrine, for many centuries the dominant strand in the Christian tradition and in international law, has tried to place conditions before the use of force can be deemed just. But governments often use ‘just war’ discourse to justify rather than prevent or condemn war and other forms of organised violence, at times directed against their own people. We all know the result: immense sums spent on armaments, weapons that are increasingly lethal, ever greater civilian casualties, religious and other minorities attacked and persecuted, and the nuclear threat still suspended over the human future like the sword of Damocles. Just war thinking is simply not equipped to deal with these developments. In any case, the ‘just war’ concept has little to say about the great social, economic and environmental ills of our time, and how these create and sustain an almost permanent state of anxiety, conflict and violence. Conscious of this, several voices in international law, in the UN system, in social movements, in intellectual circles, and importantly in the Christian churches are calling for a shift from ‘Just War’ to ‘Just Peace’. Pax Christi has produced a special 4-page pamphlet covering these issues (copy attached). Conflict prevention and conflict resolution, peace-building and disarmament remain critically important objectives. But they are unlikely to make headway until they are grounded on principles of justice, human dignity and ecological sustainability. As the World Council of Churches and Pope Francis and his predecessors have argued with increasing urgency, the effort for peace must respond to the cries of the poor and the cries of the Earth. It is against this backdrop that several organisations, including the Centre for Research in Religion and Social Policy (part of the University of Divinity), Pax Christi in Australia and Social Policy Connections, have come together to plan a series of events and publications, including a landmark conference around the theme A Just and Ecologically Sustainable Peace. The Conference will be held in Melbourne in April 2019. We would be most grateful if you could encourage people you know to participate in the conference and associated events through the channels of communication available to you (e.g. websites, email messages, social media, distribution of brochures). Please note the Program is provisional because between now and then unforseen circumstances might force us to make changes.